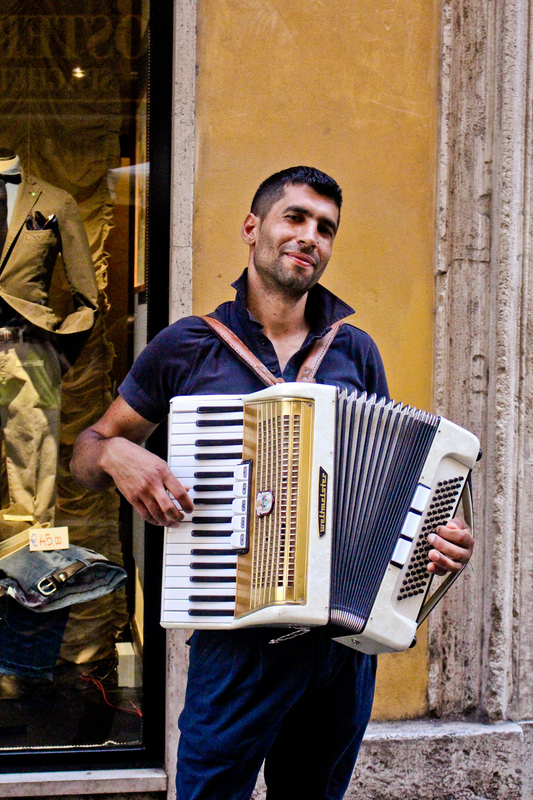 Just over a month has passed since returning from my first trip to Europe—Italy, specifically. After processing my thoughts and going through 1200+ photos, it feels like a distant, magical dream— one of which I am excited to finally share with all of you! While contemplating what direction to take this blog mini-series, so many things came to mind: New friends, exciting adventures, stretches of curiosity, respect and kindness between complete strangers over hundreds of thousands of miles. A renewed faith in the hope of humanity, in helping those foreign to your world and your way of life; love and light, smiles and an unspoken understanding of the world in that moment, deriving from the sheer excitement of crossing paths with a kind stranger that you may never meet again— all of these things come flooding into my memory when reflecting over my recent travels. I’ve never been one to make a pun on my own name. Truthfully, its bothered me my entire life as the hope jokes and pick-up lines roll in continually. But after my trip, “HopeTravels” seems more than appropriate. Of all of the sightseeing, new friends and experiences, I’m still amazed at the overwhelming feelings of the warmth & welcome from everyone we met while abroad. If I didn’t have a severe case of wanderlust before this trip, I most certainly do now. From the people, to the amazing food and the incredible historic sites, I came home feeling fortunate and enlightened. Traveling absolutely broadens your horizons, and I learned more than I could have ever expected through these new experiences. I could go on in detail for days about the explorations and adventures of my holiday, but there is no better place to start than from the beginning. 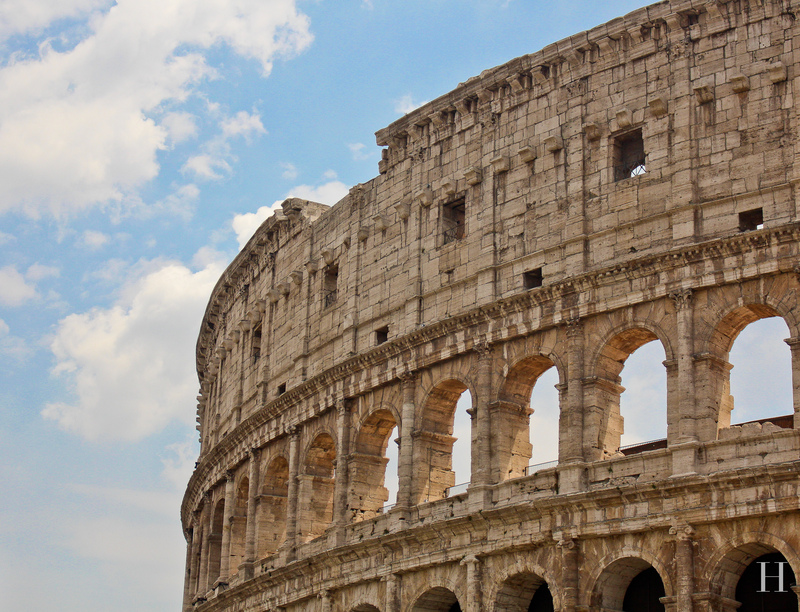 As many of you followed the Facebook documentation of my travels, you witnessed the hiccups of missed flights and the redirection of our adventures through Miami and London, and then finally on to our final destination, Rome. When using the term adventure(s), I assure you, there is no other appropriate term to describe our travels. 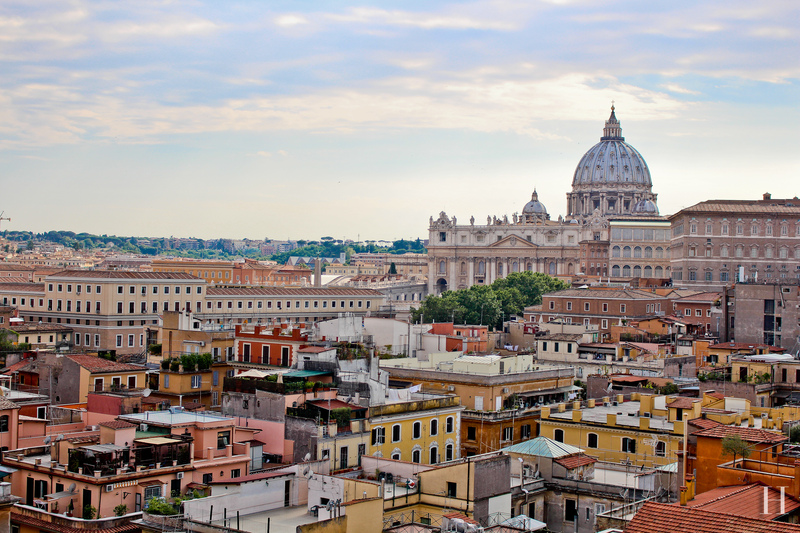 As we navigated these new cities and cultures, challenges did arise, but when you have the opportunity to visit three major world hubs, it doesn’t seem to matter. You take advantage of it. You go with the flow, and problem solving is second nature. 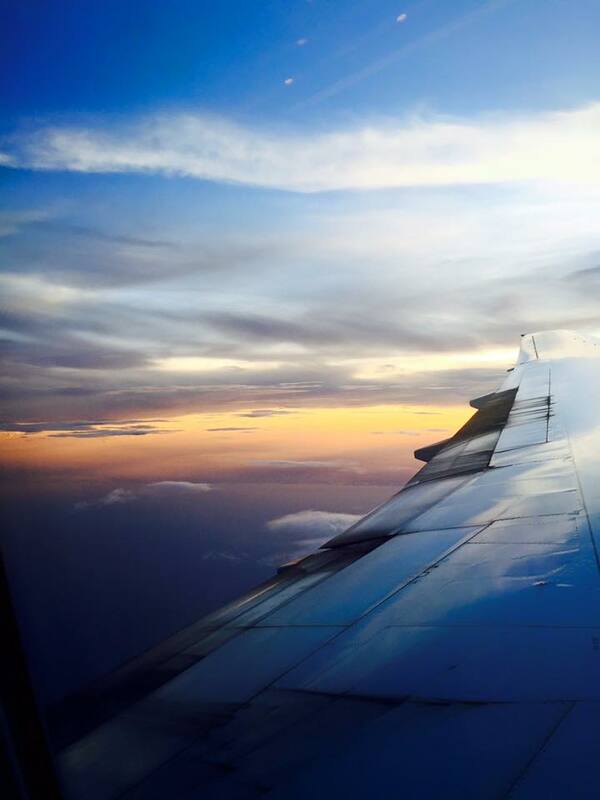 The 48 hours spent in Miami and London were whirlwind experiences. With no luggage or knowledge of either city, we just kind of “winged” it— making friends and cramming in as many sites and as much fun as possible. 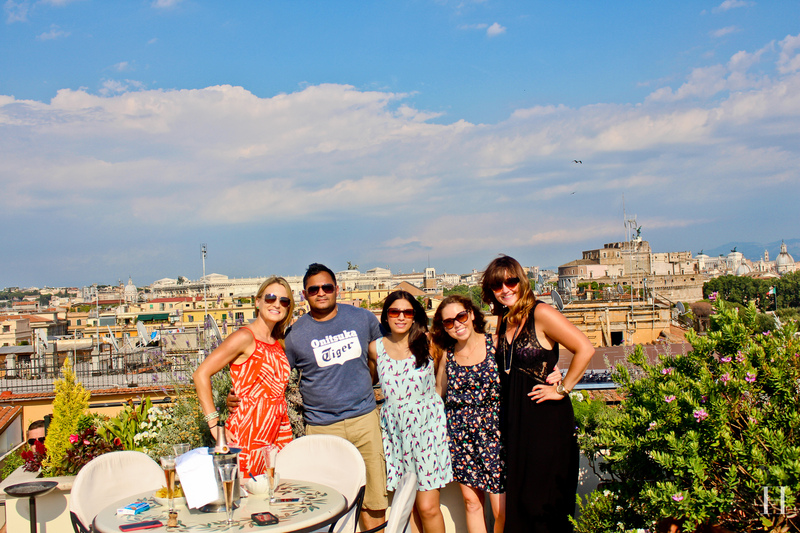 By the time we actually got to Rome, I felt like we’d been traveling for weeks, but that didn’t matter either. We’d finally arrived in ROME! I remember stepping off of the plane somewhat tired and so ready to reunite with my luggage— but overwhelmingly, I was excited! If it weren’t for the graciousness and generosity of so many, our trip wouldn’t have been the same. Fortunately, Claire, Kate & I had a fairy godmother/travel agent, Becky, who essentially planned the trip for us, set everything up at our hotels and connected us with some locals, Alex and Michela, whose help was invaluable! Alex was kindly waiting to pick us up at the airport to take us to our resort, and what a relief it was to actually have a ride with all that luggage! 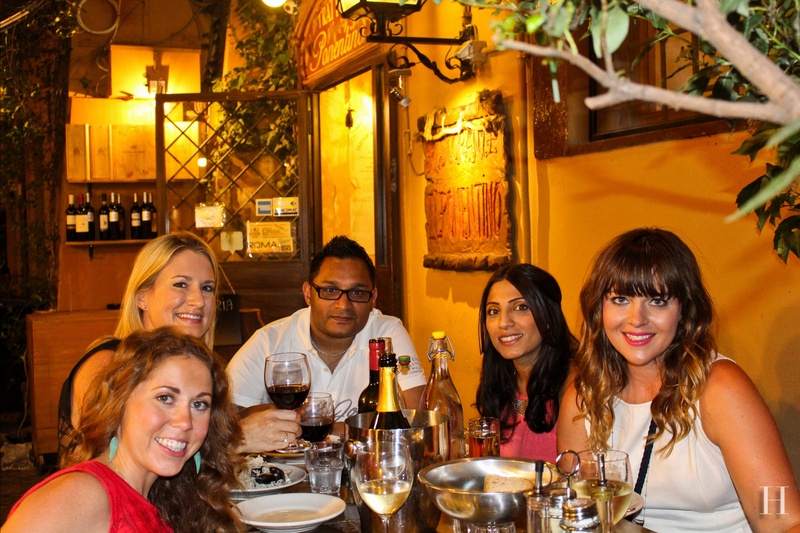 Several days into our trip, we reunited with Alex, his wife Michela and their beautiful daughter for an amazing dinner at a trendy, local spot where we sat poolside at dusk, enjoying some Italian wine, authentic food and wonderful company. Between helping us out with rides, giving excellent suggestions on how/where to do things in Rome + following up over Facebook to make sure we didn’t need anything else, their kindness and generosity towards us throughout the trip leaves me speechless. We were fortunate enough to have made many more friends over the course of our trip, too! On our first full day in Rome, we met Sid and Harby, a married couple from Birmingham, while on a tour of the Colosseum. We started out as photo buddies— I would take a photo of them, and they would reciprocate the favor. We began to chat more and more over the course of the tour, sharing stories and tons of laughs, and post tour, decided to hop on the metro together to grab a bite for lunch. Claire, Kate and I rush to the meeting spot for our Vatican tour only to realize that we were scammed (long story), so we checked in with our new friends. It was Harby’s birthday, so they invited us up to the rooftop garden of their hotel and had a chilled bottle of champagne waiting to with share us. 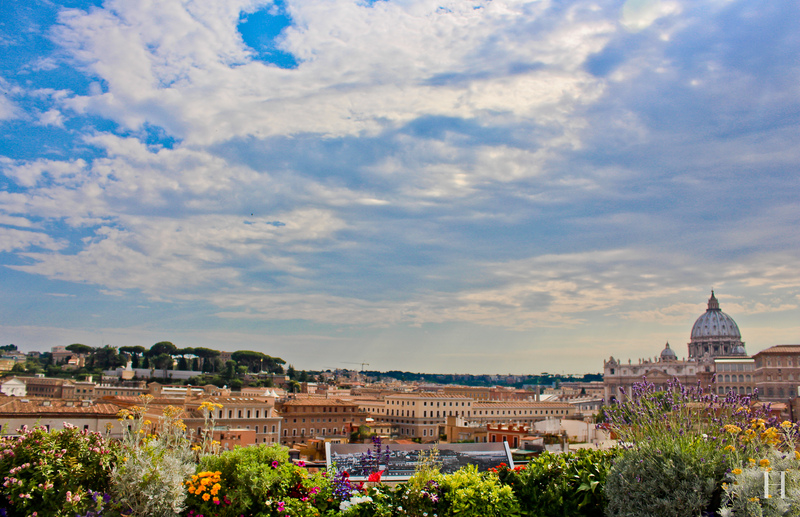 The rooftop garden had the most incredible 360 views of Rome! It was simply a magical afternoon full of bubbly, sunshine and great conversation as we enjoyed Rome’s breathtaking landscape while celebrating new friends. Alex & Michela and Sid & Harby are only a few examples of the fascinating, incredibly kind people we met. Just reflecting back over these memories makes me smile as I think about the refreshing, in-depth life conversations had and special moments shared. I remember the laughs, the advice and close hugs as if it were yesterday, and it makes me want to give more happiness and share more positivity in my every day life here at home. Catch the rest of our Italian adventures next week! For years now, I’ve implemented a simple concept in my business that requires little time, but yields great results– sending personal, hand-written notes on a routine basis. Whether it is to a new acquaintance, a past client, or just a friend or family member, everyone seems to appreciate the time and thought put into this small gesture. So naturally, when I randomly met Elizabeth and William of Card Happening and heard their story, I was captivated. 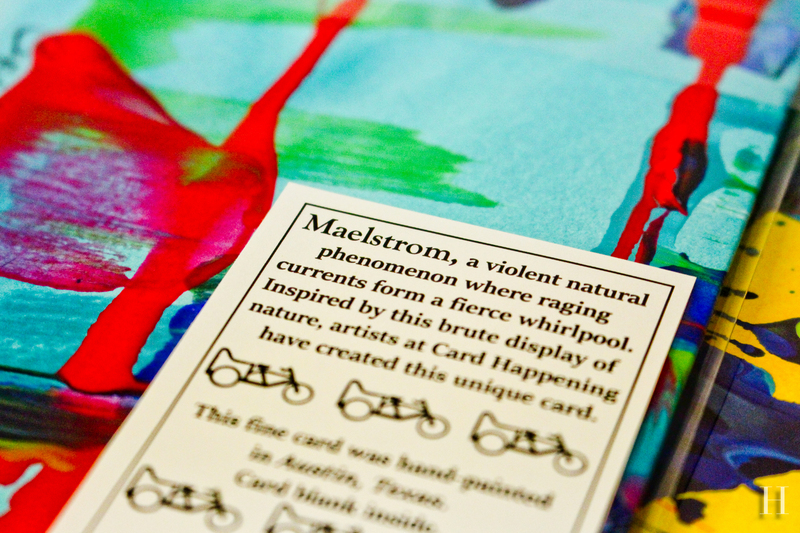 Essentially, they take the personal note to another level with one-of-a-kind, stunning hand-painted cards inspired by natural phenomena. While their styles reflect and are inspired by certain phenomenon, no two cards are the same, making each personally sent note truly unique and different from any other. And since I’ve had the pleasure of spending time with the founders of Card Happening, I would love to introduce them to all of you, too. 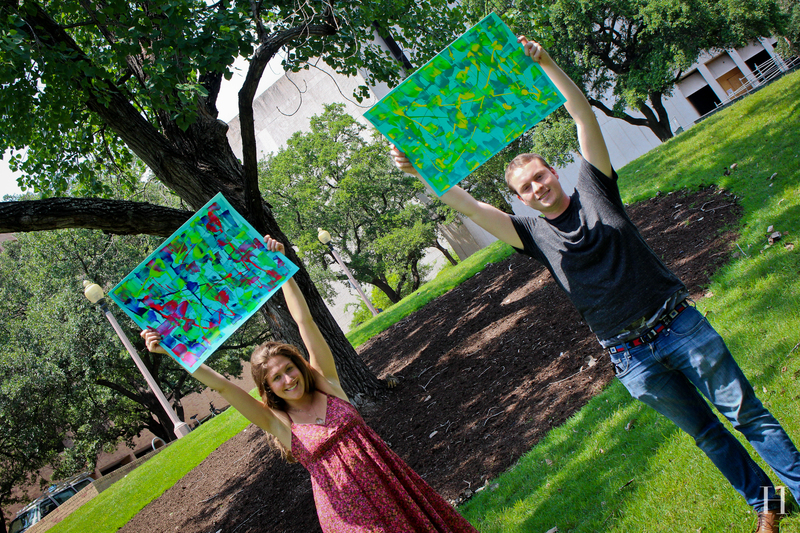 They are a fabulous, two-person team: William is the Sales and Applied Technologies Rep, and Elizabeth is the the amazing artist behind it all. I will briefly share their inspiring, dream seeking journey, but as I cannot fully do it justice, I encourage you all to read their story on their website here. 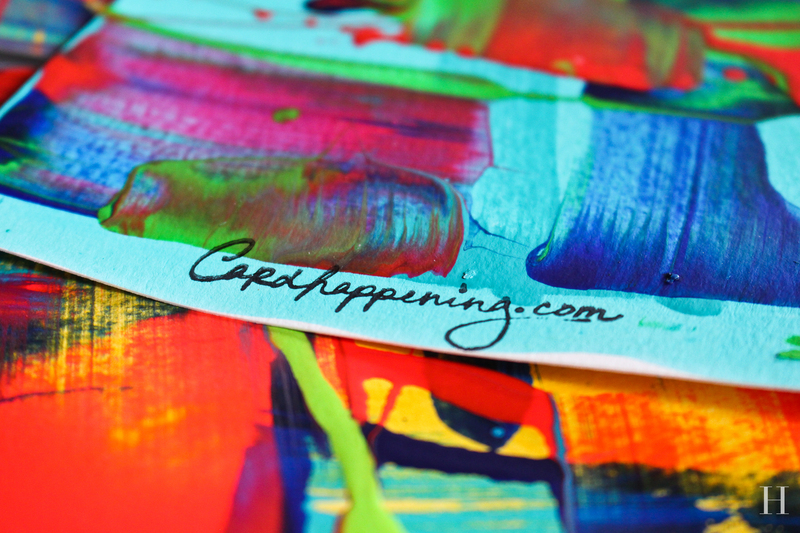 Overall, Card Happening is driven by the fundamental belief that beauty is a happening, hence the name Card Happening. 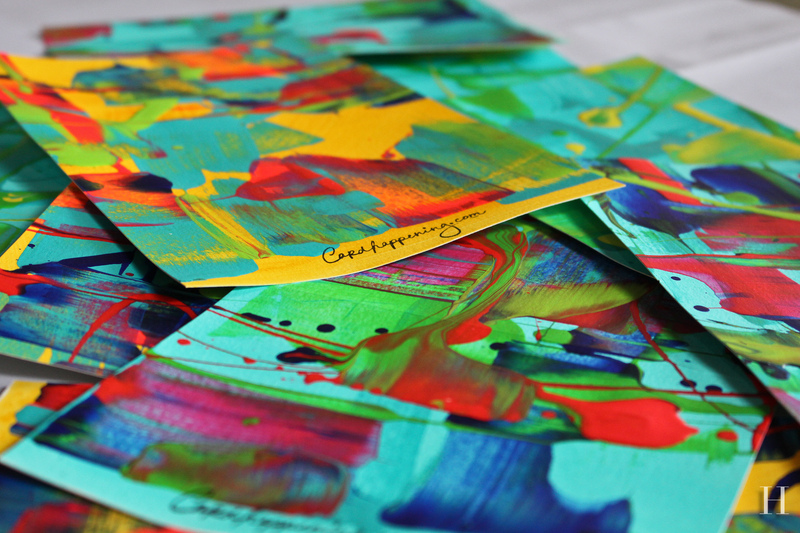 Inspired by the wildness of nature, each individual stroke and layer on every card is intentional– carefully thought out by Elizabeth in order to create a mesmerizing experience, different for each recipient. 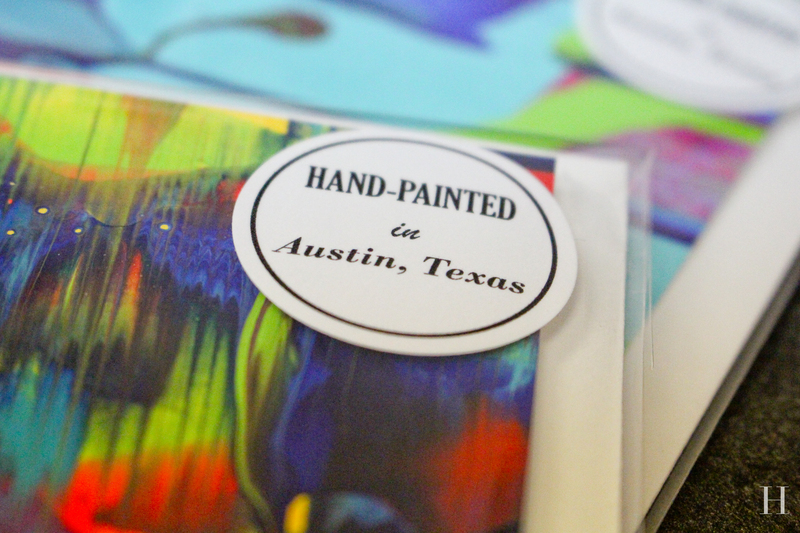 Elizabeth has been hand-making greeting cards for friends and family out of various materials for many years. 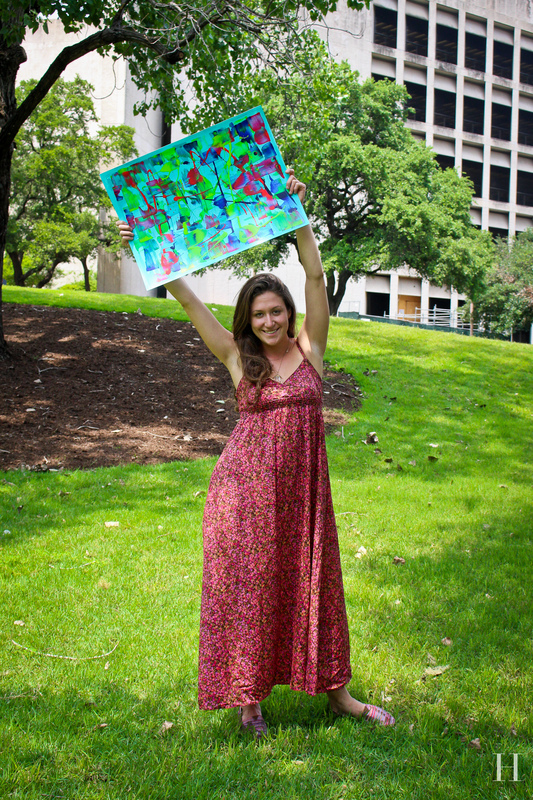 From paints to wrapping paper, to soup can labels and much more, each card was different as she conveyed each greeting through her artistic ability and creativity. 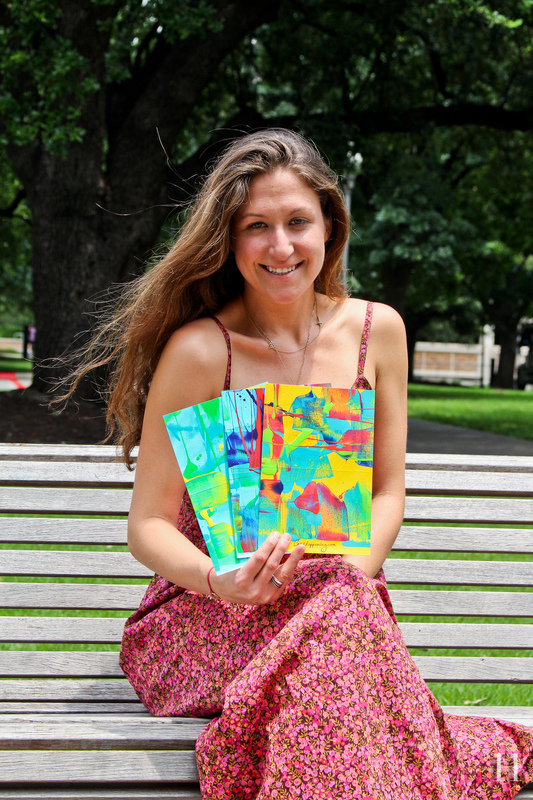 Elizabeth loved creating these beautiful works of art so much so, that she and William decided to share this alluring concept of her one-of-a-kind greeting cards with the public– and so Card Happening was born. Upon first meeting Elizabeth and William, they generously gave me a set of three of their unique greeting-cards. Even in that moment, I felt honored to receive their simple gift as I immediately recognized the sheer beauty and passion put into the creation. These greeting cards leave wonderful, lasting impressions. 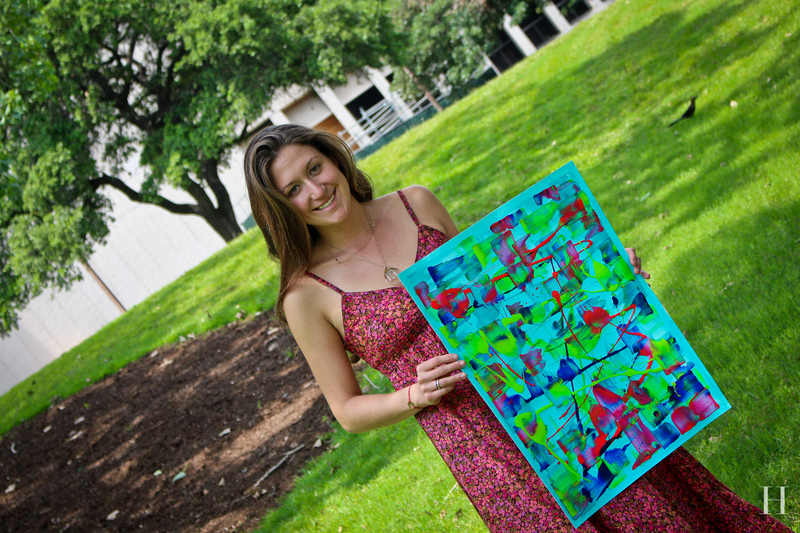 The colors are vibrant with each stroke wildly different from the next, and the results are strikingly beautiful. Since meeting Elizabeth and William, I’ve given many of their cards to clients with my personal message inside. People absolutely love them! And its so much fun to go through and pick out a specific style and card for each client + I LOVE supporting local businesses. Its a win-win all around. Lucky for you guys, they are giving away sets of three cards (one of each style) to three lucky winners through HopeLivesAustin in the next 24 hours! Enter to win the contest by liking HopeLivesAustin on Facebook or Instagram, by liking @CardHappening on Instagram or by sharing this post! 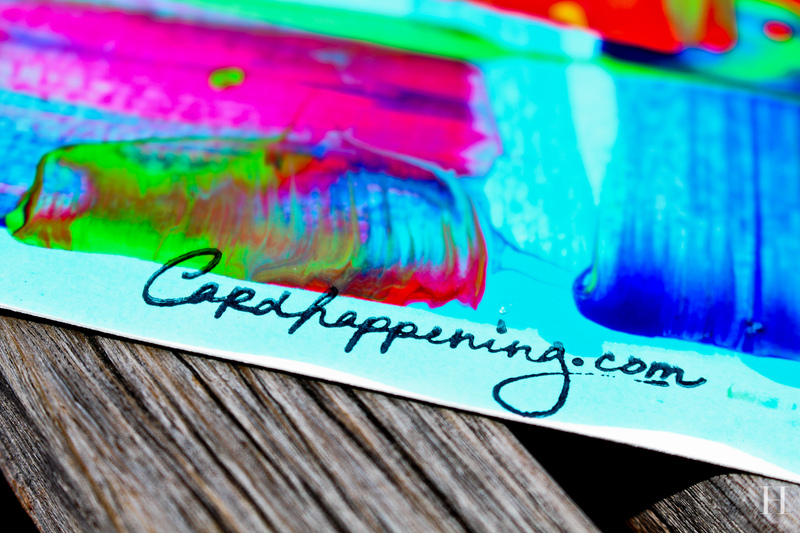 I love Card Happening and I know you will, too! I grew up with a very strong appreciation for music, largely thanks to my rockstar Daddyo, a musician himself, who played all the classics for us growing up. From Led Zeppelin, to Bob Dylan, Stevie Ray Vaughn, Rush, Chicago and many more, music was always playing at our house. 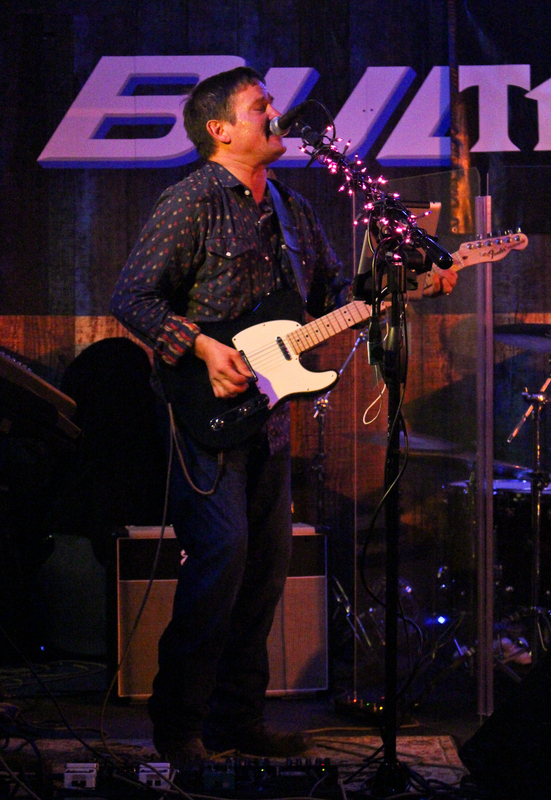 My dad, John Teel, while playing at a gig with his band, The Fog. 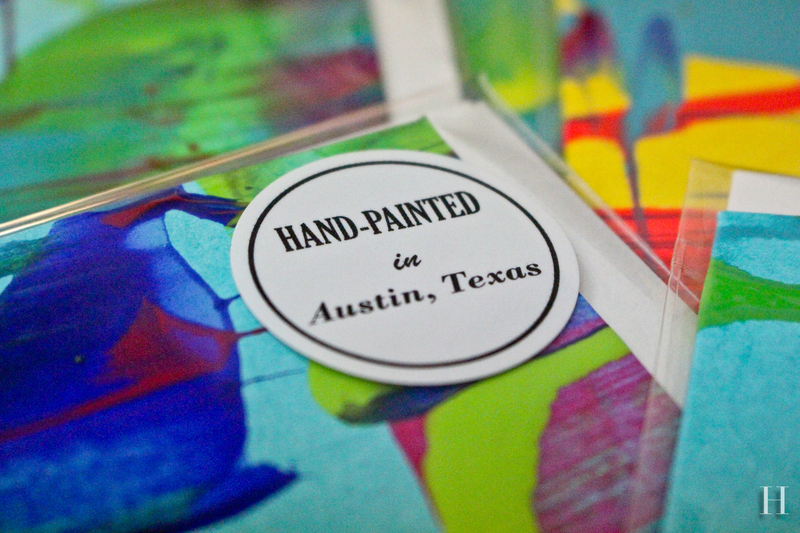 Years before I ever moved to Austin, I knew of its reputation as the Live Music Capital of the World– and having lived here for many years now, I can relay with confidence that it definitely lives up to that reputation. From Austin City Limits to SXSW and everything in between, there are countless great shows here year round. I’ve been fortunate enough to experience the live music scene in many capacities over the years. 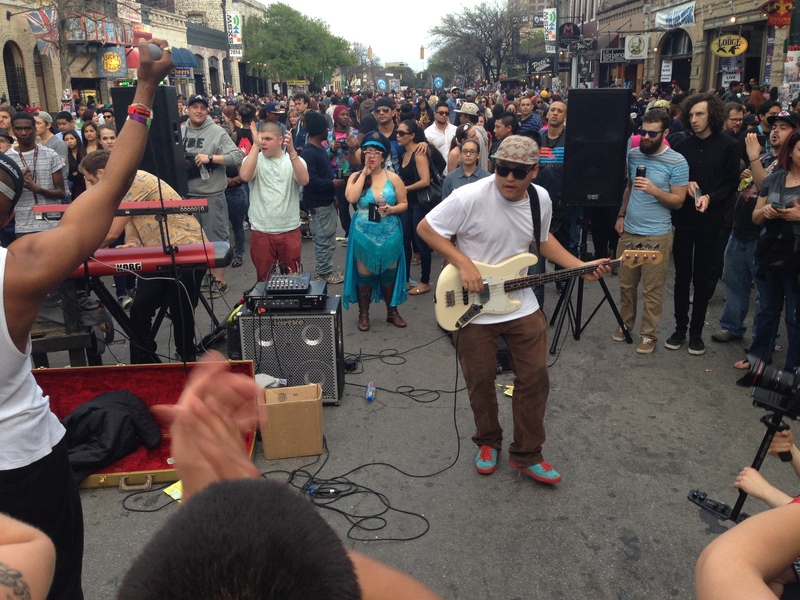 From countless shows at Stubbs, Elephant Room, Moody Theater (ACL Live) & other venues, to the festival scenes, to just taking a casual stroll down Sixth Street, you can literally see live music on any given day in Austin. How awesome is that?! 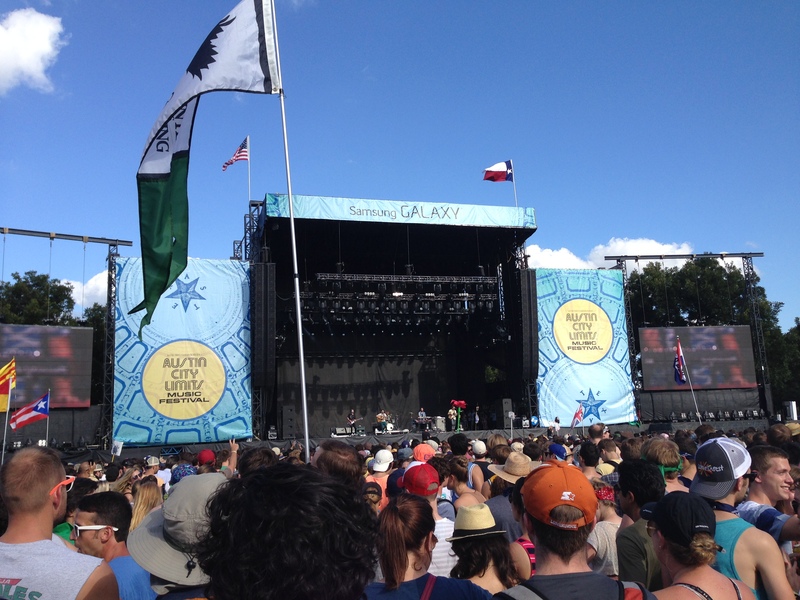 Of the countless shows I’ve seen, there is no way to choose a favorite, but the Austin City Limits Music Festival is a one-of-a-kind experience (as is SXSW). You will have to fight the crowds, but it is more worth it! The headliners are always great, but make sure to catch the smaller shows too. I’ve discovered so many great artists that I had no knowledge of prior to ACL, but that are now on my regular playlists. The same goes for SXSW. The concept of music in and of itself is, simply stated, magical. It can evoke so many different feelings in people. It motivates. It emanates love and peace, among other feelings. It can bring back crystal clear memories of times and places that were seemingly foreign before hearing a certain song or album. It is timeless– in my opinion anyway. 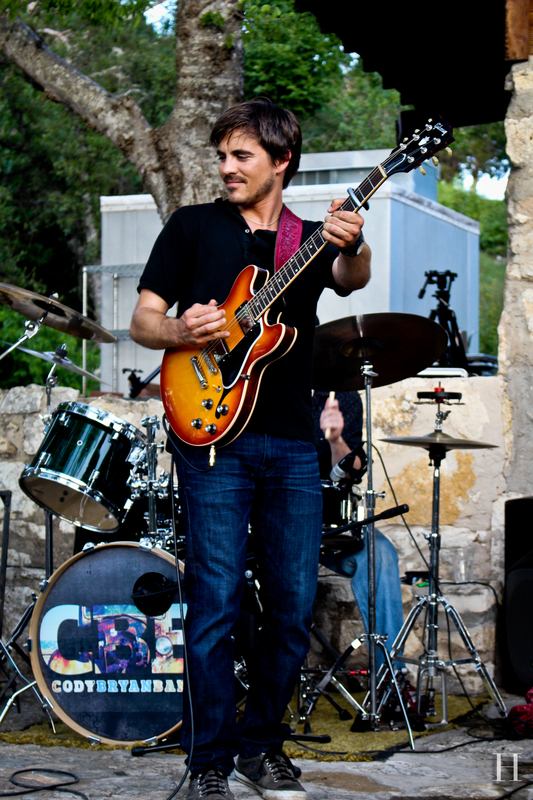 While this photo was not taken in Austin, it encompasses so many of my thoughts and feelings today about music. 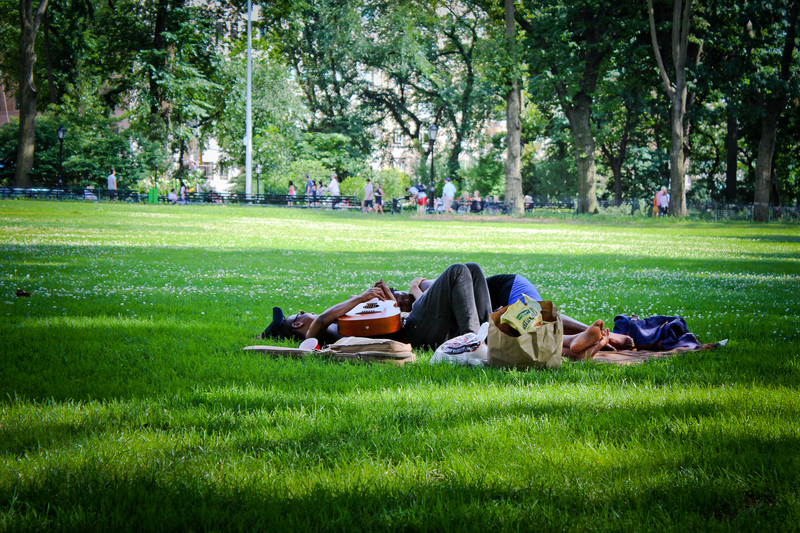 Two summers ago, while strolling through Central Park in NYC, I came across this couple. He was playing guitar, and they were both singing. It way joyful, playful, and a blissful moment even for a bystander like me. It was all about the music. I mentioned this before, but you can see live music in Austin literally any day of the week. If you haven’t planned to see a show in advance, no worries. Just take a quick jaunt down sixth, or check out this great link to find a live show based on district, venue or genre. Or, feel free to ask me! 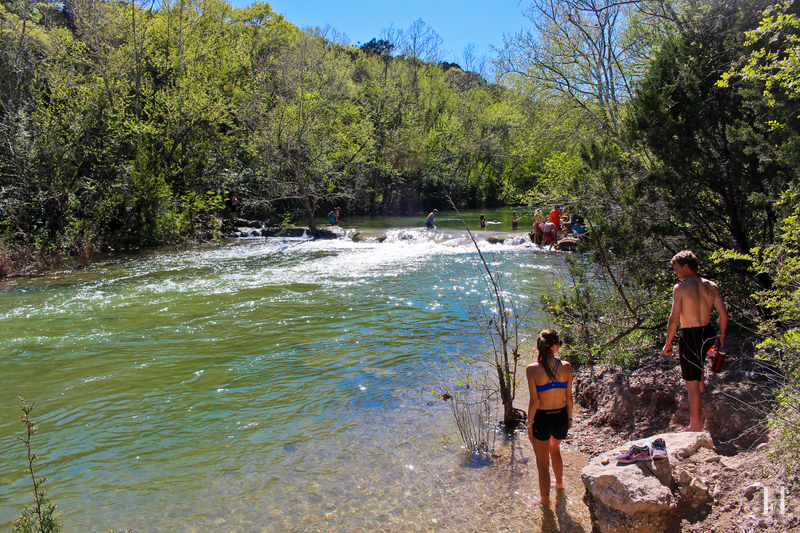 Spring is arguably my favorite time of the year in Austin. The weather is phenomenal, the vegetation lush, and the city’s energy is vibrant and alive. 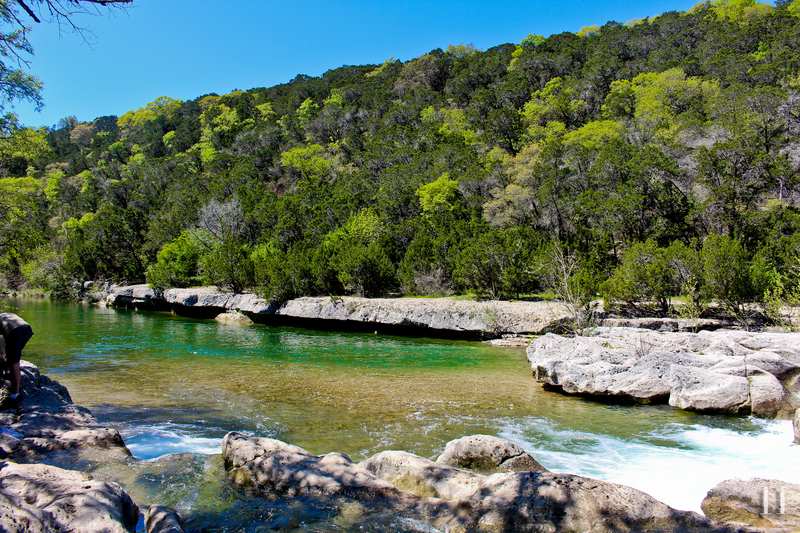 Last Saturday I made a solo trip to the Barton Creek Greenbelt via the Twin Falls trail head. Fully prepared for my adventure with plenty of water, my camera, a journal and some good tunes, my blissful day began. I arrived at 10:30 AM with no real intention set for the day other than to soak up some sun and to reconnect with nature. The real estate market is in full swing right now, so I am constantly on the go. This was the first Saturday I’d had to myself in quite a while, and I couldn’t think of a better way to spend it– hiking, photographing, journaling, people-watching and soaking up every ounce of energy and light possible. As the day went on and my phone eventually died, I completely lost track of time, and for once, I was completely ok with that. Eight miles, hundreds of photos, twenty pages in my journal and a slight sunburn later, I made it back to my car around 5:30 PM. Words of influence for the day: happiness, positivity, optimism, hope, give, light & love. 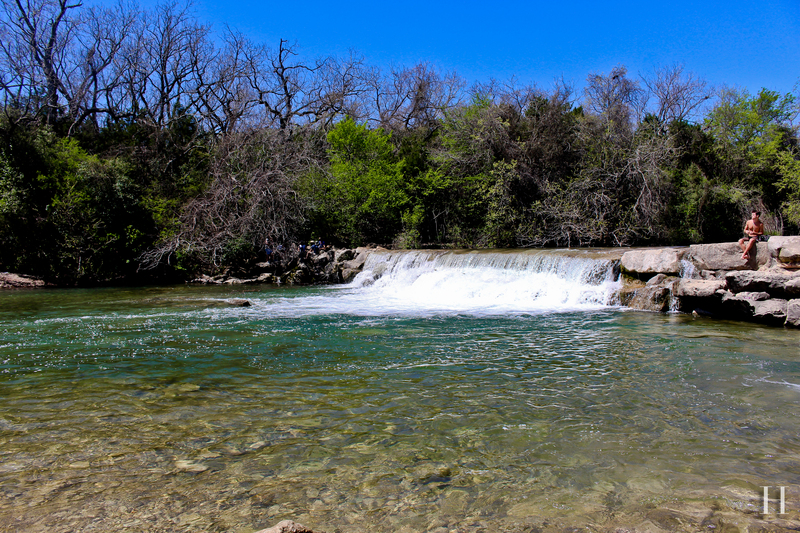 I made a trip to the greenbelt alone today. Its absolutely incredible. 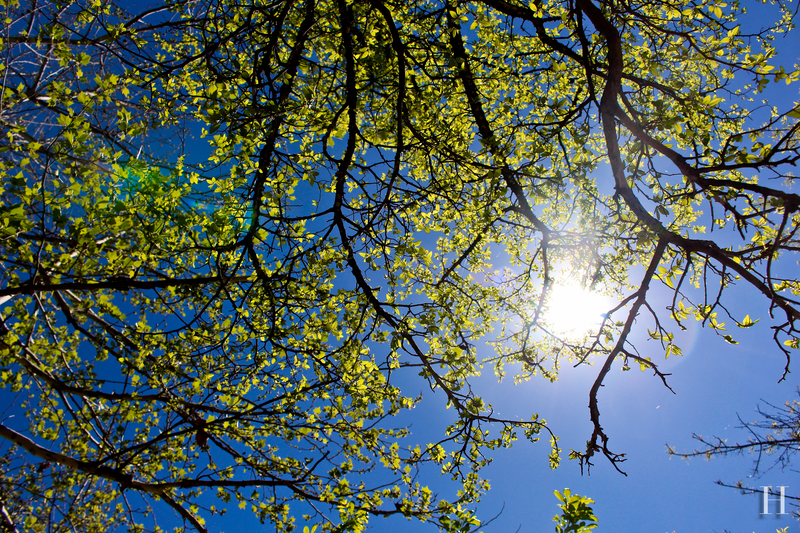 the weather is ideal– 70’s, sunshine and not a cloud in this deep blue Texas sky. I’m sitting on the cusp of Sculpture Falls, soaking up the sun, the vibrant energy of other greenbelt patrons, and of course, the natural beauty of this stellar treasure. Everyone you encounter shares a warm smile, a mutual understanding that out here, we are all disconnected from the daily bustle of the city. In that respect, and in many others, the greenbelt is such a friendly space. Its a natural haven of beauty. Its a place to slow down. To reset. To escape the stress, worries and constant go-factor of every other day. As I sit listening to the crystal waters rushing over the falls, I too reset. I thank God for the sheer beauty of His creation and for the opportunity to live here, in such an amazing city where I can retreat into nature within a matter of minutes. Today I ask myself: what can I do to become a better person? What can I do to enrich others’ lives? What can I do to make tomorrow better? Give thanks. Give hope. Give positivity. Give love. 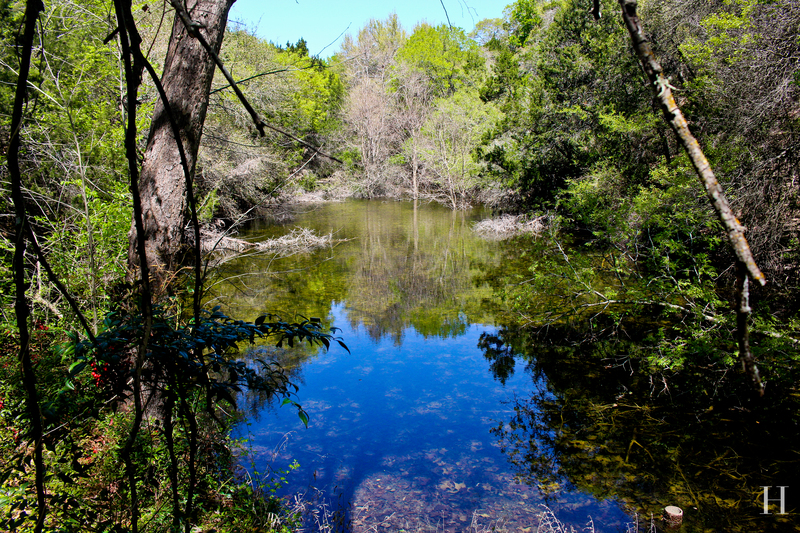 The feelings brought on by this natural oasis almost bring me to tears. Its an incredible, calming inner-peace. I feel like I could spend days here– listening, observing, appreciating. Life is good most days, but today its nothing short of wonderful. 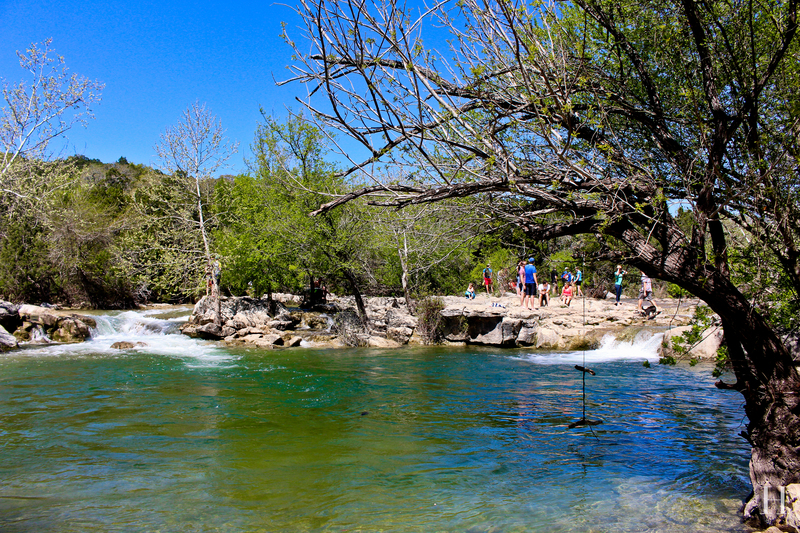 If you haven’t hit the trails yet this year Austinites, get out there! And if you’re just visiting or new to the area, I would be happy to give you some direction on where to go. Just give me a shout! 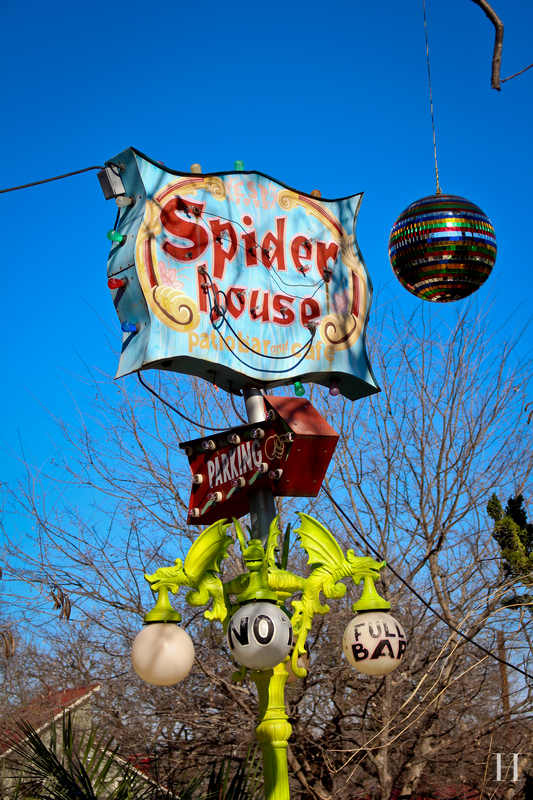 In all of my time at UT, I never once visited Spider House. Curious, as I lived only a few blocks away from it most of my time in school. I suppose I was wrapped up in the other various options available to a young, small town girl new to the city, but now, I can’t get enough! These days, I tend to purposefully venture back over toward campus, nostalgic for those relaxed, sunny afternoons post class spent blindly exploring an infamous city without a care in the world. 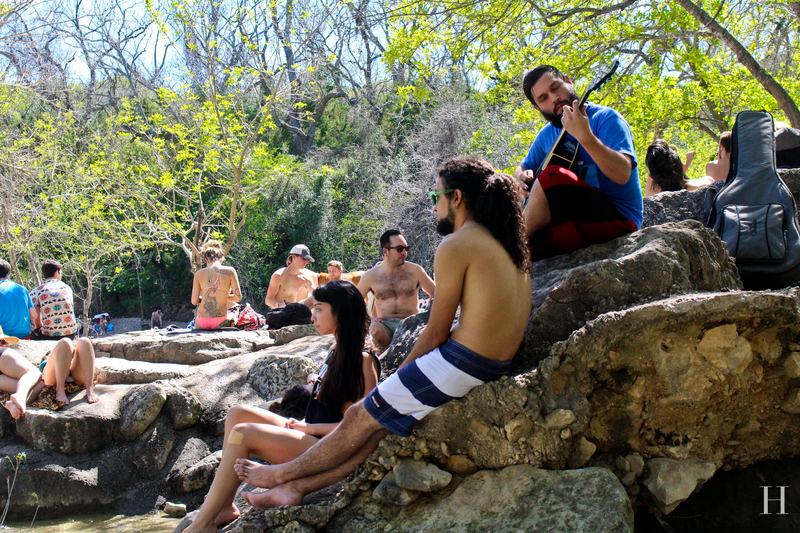 It was freedom like we’d never known it– and back when Austin was still a hidden gem. The beauty in this? 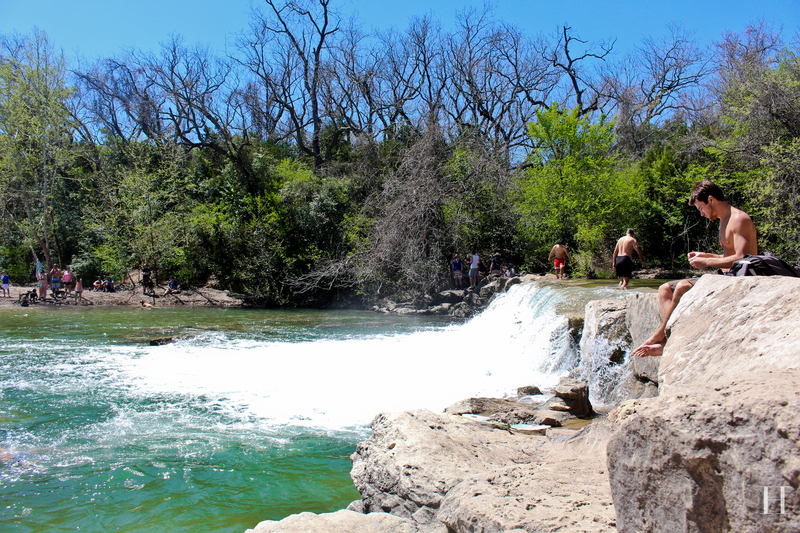 Well, its obvious and overflowing, but bottom line is that Austin is pretty damn cool. 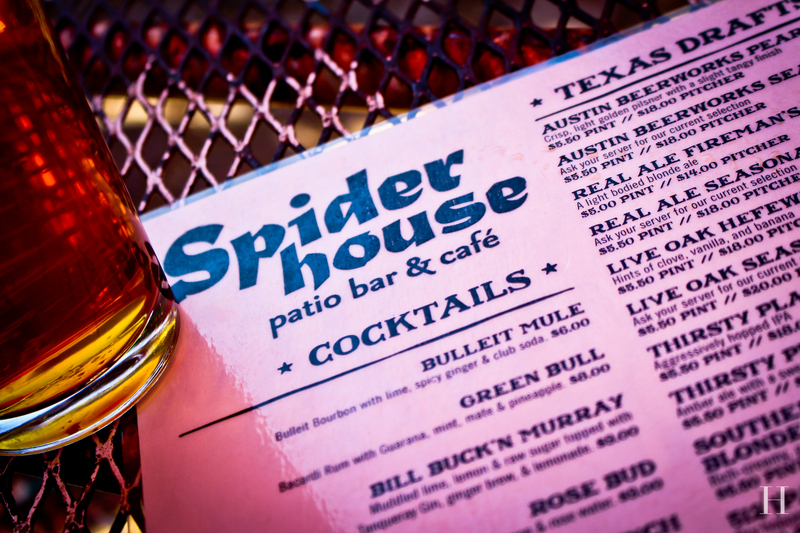 I am discovering and rediscovering so many amazing experiences– and like with Spider House, in places I may not have expected before. I came into Spider House for the first time after a relocation client for the Hyde Park area (north of Campus) called to say they were running an hour plus behind. No problem, I’m pretty good on the fly. It was a beautiful sunny day, and I need some free wifi and possibly a coffee, so I stopped in to check it out and try to get some work done. Since then, its been a go-to when I’m in the area. 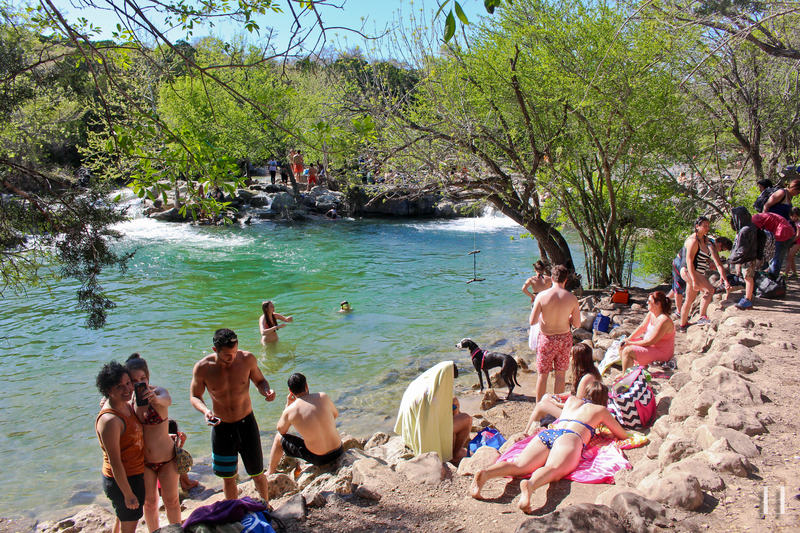 It is another one of those iconic-Austin, happenin’ spots that not too many people would think to regularly frequent. They have good coffee, AMAZING tea (complete with beautiful vintage teapots and matching teacups), delicious food and a full bar, too! 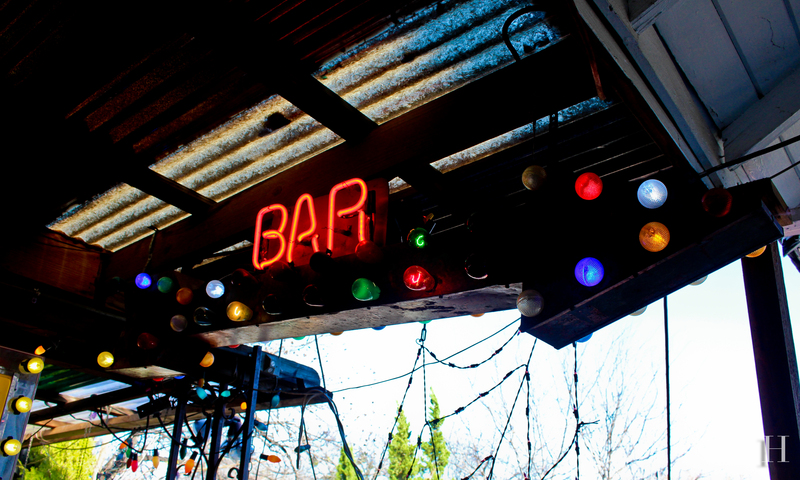 Seriously, its like a one-stop spot full of character that epitomizes the Keep Austin Weird vibe. 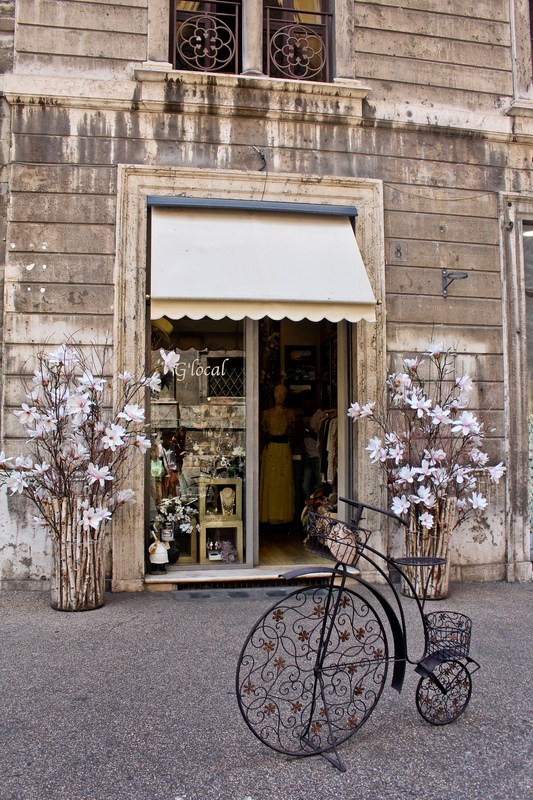 The atmosphere is very relaxed, and they have a great outdoor seating area. Spider House also hosts great live shows in their Ballroom! I plan to swing by for their line-up during SXSW. This is definitely one of my fave little funky Austin joints, and I know you guys will enjoy! SXSW is quickly approaching, and as I tediously plan for this year’s showcase, I can’t help but reflect over SXSW 2014. 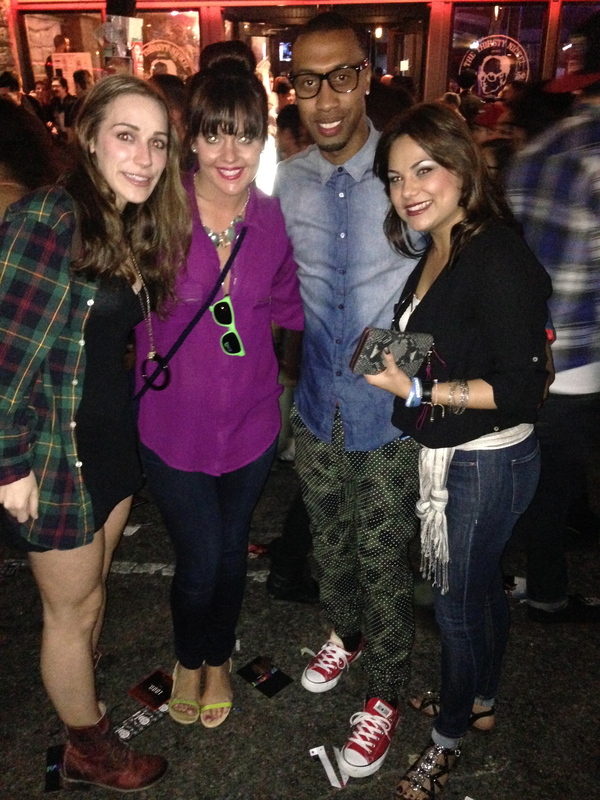 Believe it or not, after attending UT for 4-5 years beginning in 2006, last year was my very first SXSW experience! Luckily, my little teacha-friend, Stephanie, was on Spring Break so she was able to join me for the week’s adventures. 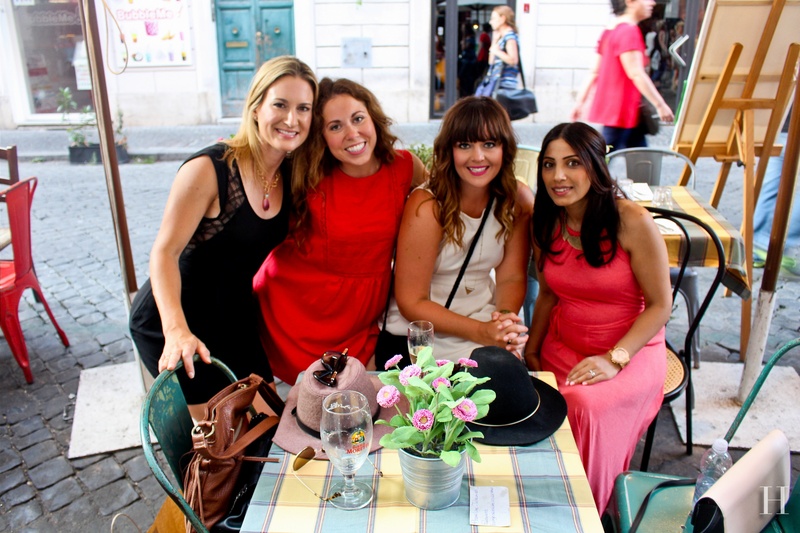 It was literally a life-changing experience– like a little stay-cation jam packed full of fun, a completely new way of experiencing my beautiful city! Stephanie and I at the 2014 Cusp by Neiman Marcus party. As I go back through all of the photos, the experience seems almost indescribable– so much music, so much fun and a people-watching paradise! Although there are many great events to attend for the film and interactive sectors too, we focused on music. The best part? We did it all for free! 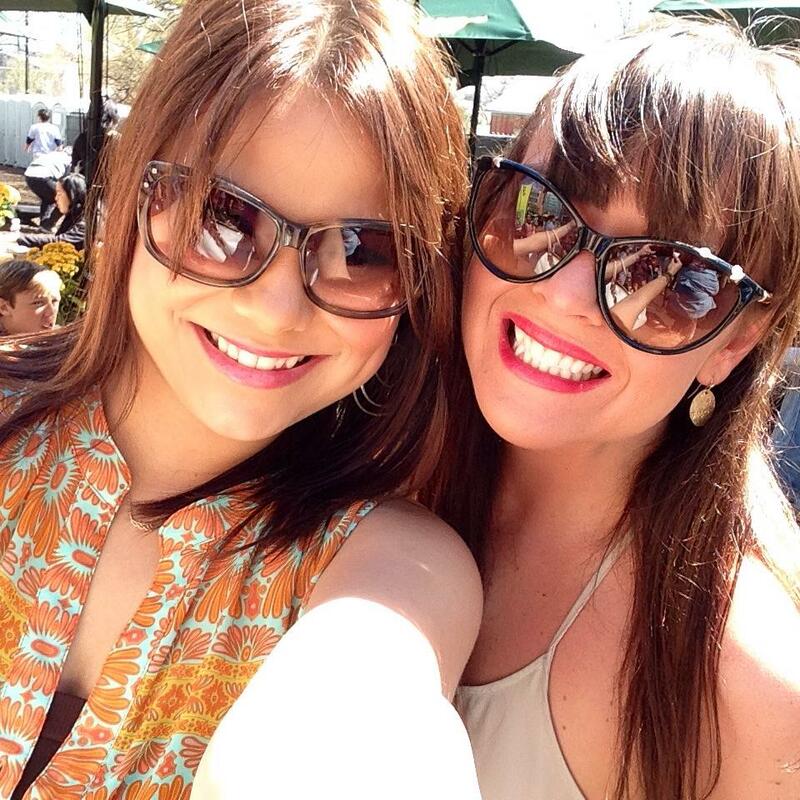 As the little SXSW virgins that we were, deciding when to go where was very overwhelming! Its not just about which musicians to see, its about where you want to go next, where your friends are, the venue/event lines and of course, the free drinks. And don’t forget about the hundreds of miles you’ll be walking. Even with the help of our good friend Elizabeth’s detailed Excel spreadsheet, organized by venue and broken down by artist, day and time (thanks Lizzy), we found ourselves running around like little chickens. The first show I attended was by the Local Natives at ACL Live Theater, and it was AMAZING! Check out my Instagram video of their set here! Steph got into town a few days later, and so our adventures truly began. On the first day, we started by just roaming the streets downtown, taking advantage of the free food, free drinks and street performances. One of the best performances we heard while cruising the street was probably American Authors perform Best Day of My Life. 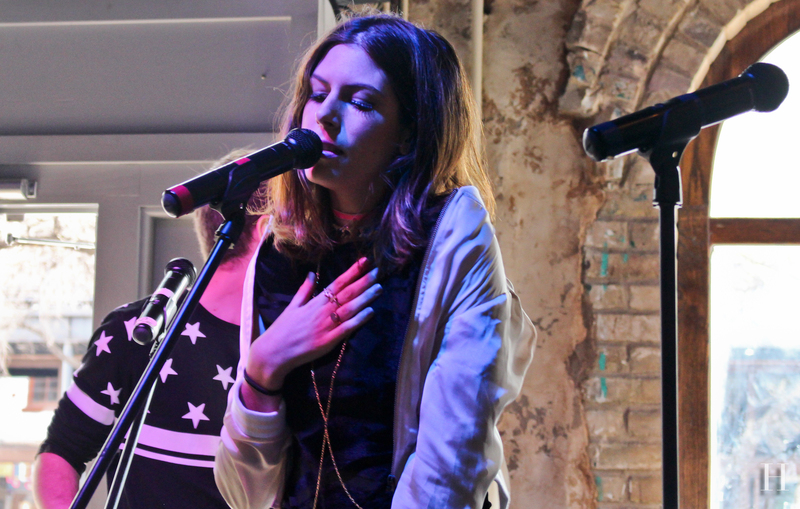 It was invigorating, and it really set the tone for the remainder of our SXSW’ing. 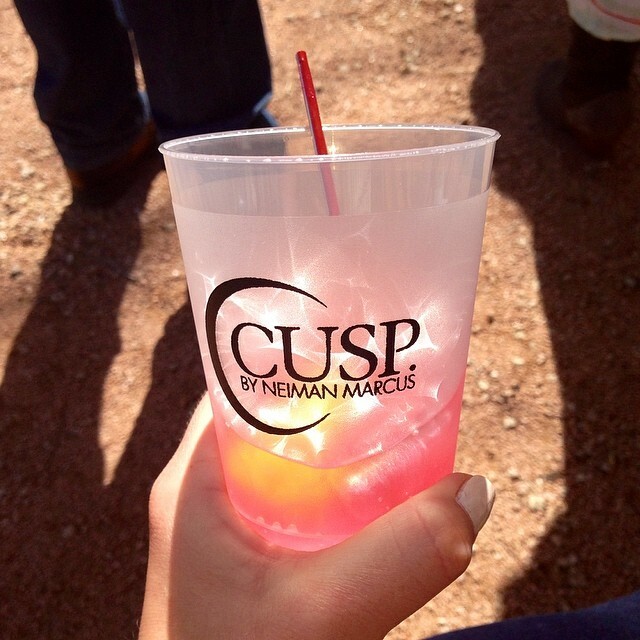 Shortly after, we wandered over to Rainey Street, and ended up at the Cusp Party by Neiman Marcus. 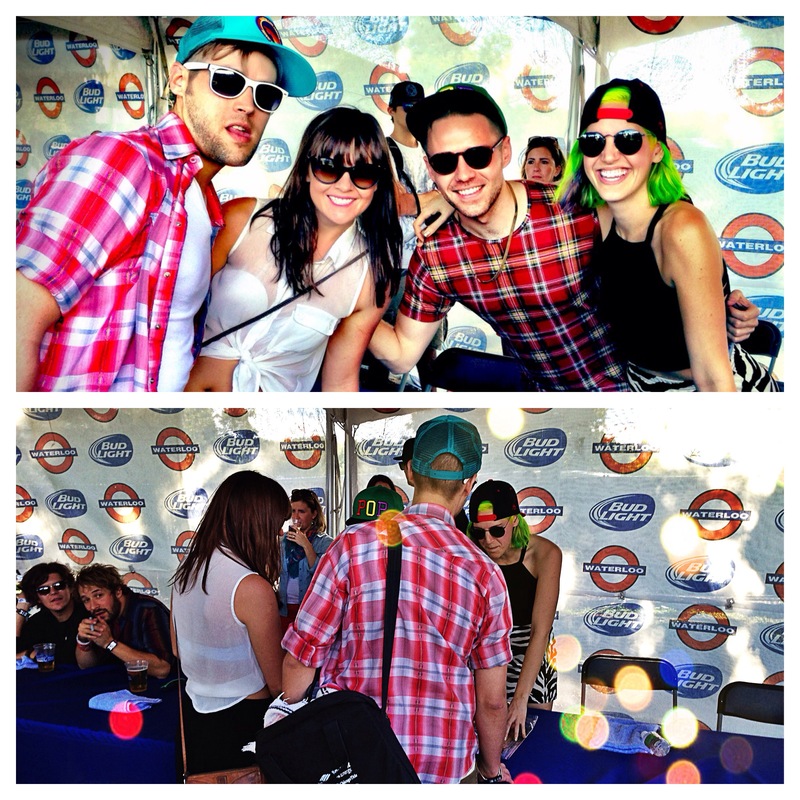 We saw several great bands, had some delicious drinks and were pampered with free Bobbi Brown makeovers! Can’t beat that! This story still makes me giggle, but later that day, a guy stopped us on Sixth Street. All we had to do was dance the robot and yell “we love Doritos” while he videoed us and posted it to our Instagrams. 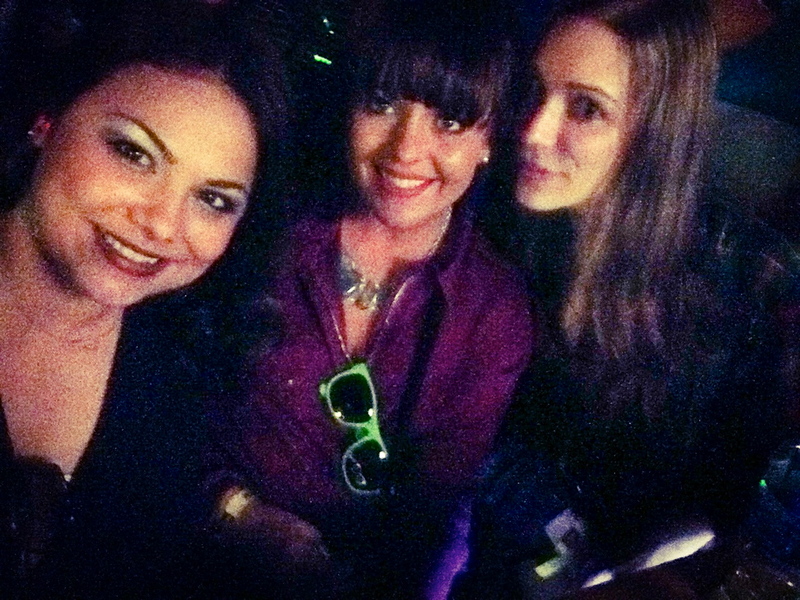 Of course, we did it, and we even got all of our friends into VIP later that weekend! 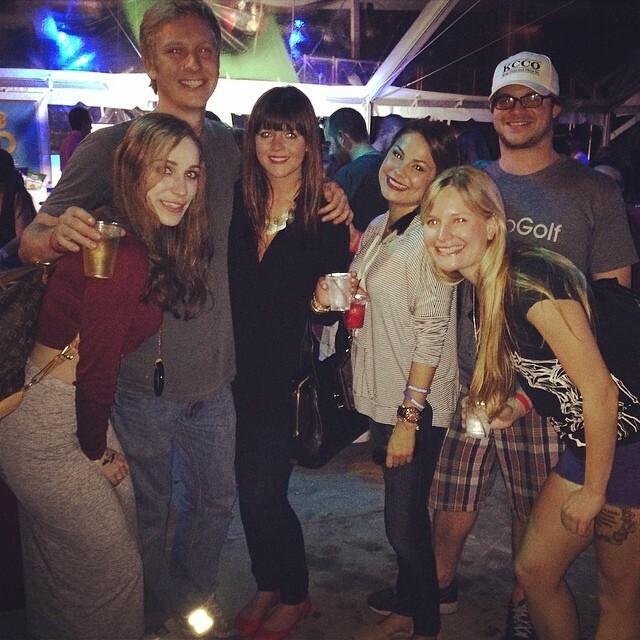 Our VIP group at the Doritos Stage for Ludacris! 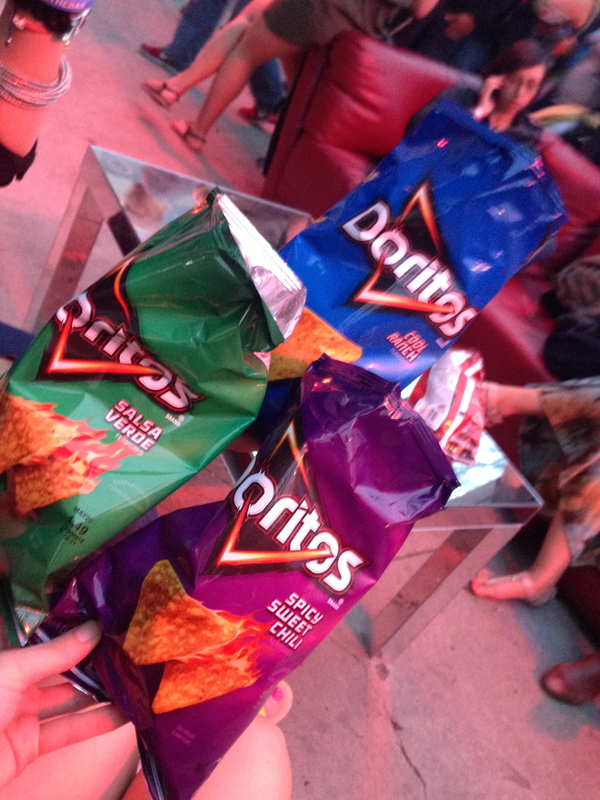 Oh, and we had free Doritos for days! Not something we normally eat, but after burning so much energy walking around all day, we were starving. While grubbing on Doritios in the VIP lounge, we actually had a Doritos rep come up to us asking if we would sign waivers for video of us to be used in commercials! No joke. The next day I had to work– met with new clients, showed 12 homes and wrote an offer! Whew! Fast forward back to SXSW. 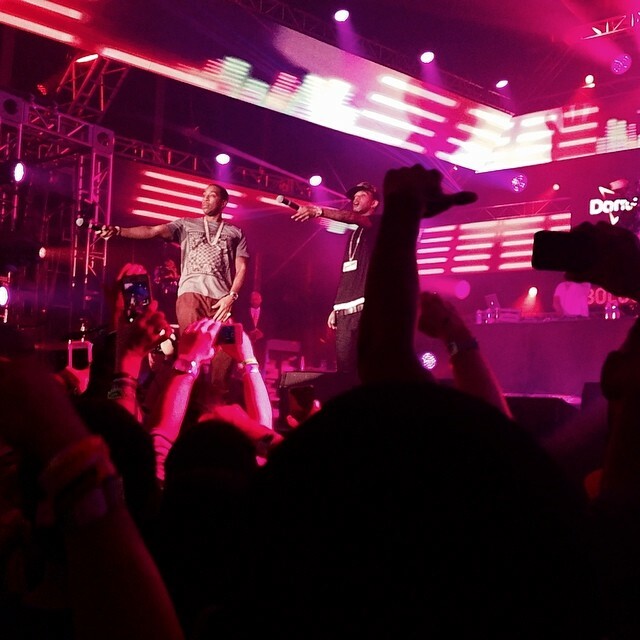 I made it just in time for the Ludacris show, VIP style. It was a magical night, and we were on such an energy high that we decided to end it with a major dance party at The W.
Needless to say, I was 100% exhausted on Sunday and still had to hold an open house AND show buyers. Every single second was worth it though, and I can’t wait to do it again this year! 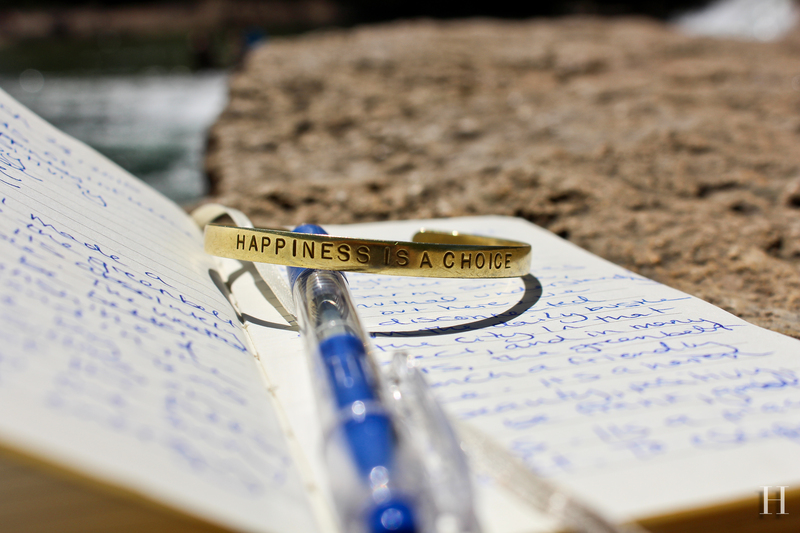 A new year, a new plan–> and that my friends, will be SXSW Part Two, coming soon on Hope Lives Austin. 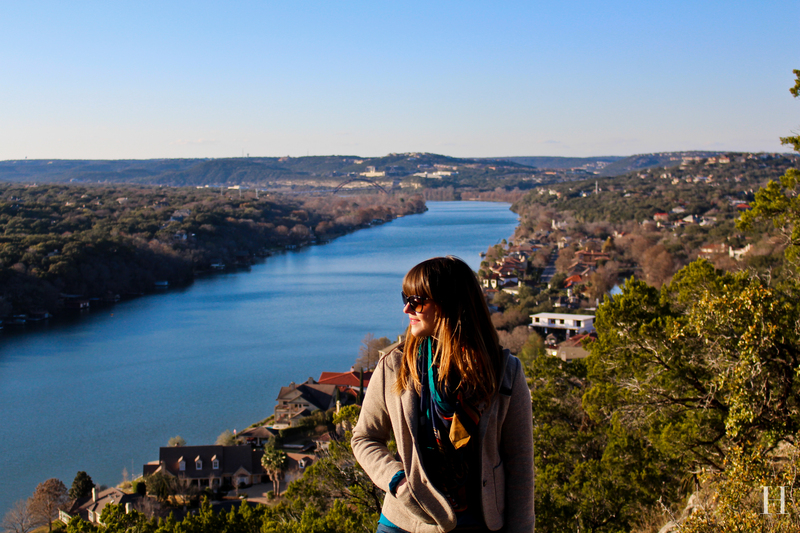 Anyone and everyone living in this great city knows of Mount Bonnell and has most likely visited at least once. 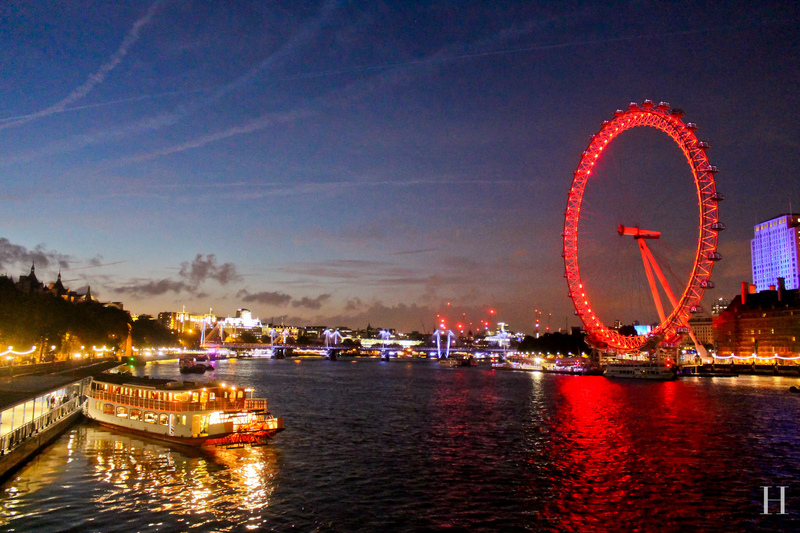 If you are in that tiny percentage of people who haven’t gone, add it to your bucket list now! 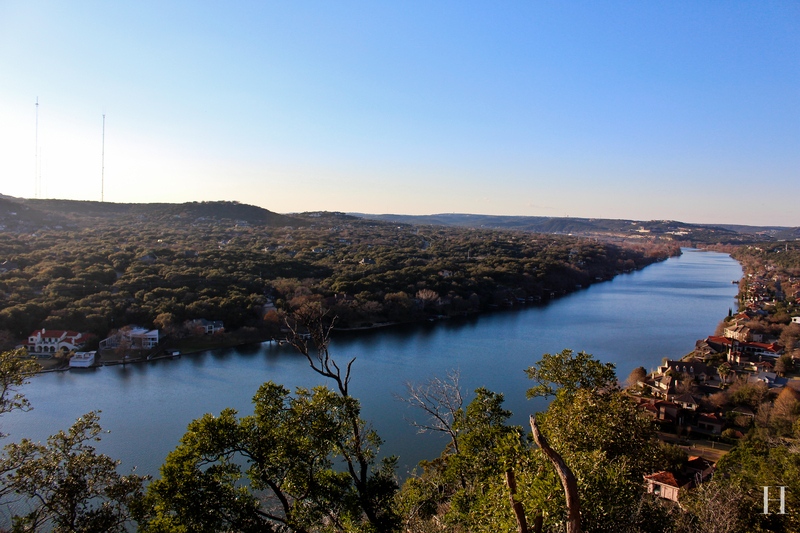 Arguably, there is no better all-encompassing vantage point in Austin than this amazing vista. 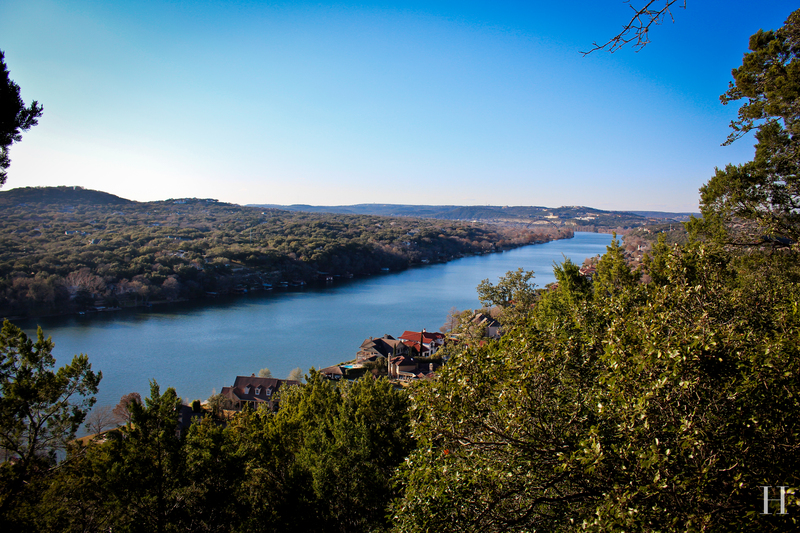 Just a short hike up the limestone steps, you will find incomparable views of Lake Austin, the surrounding hills and downtown. 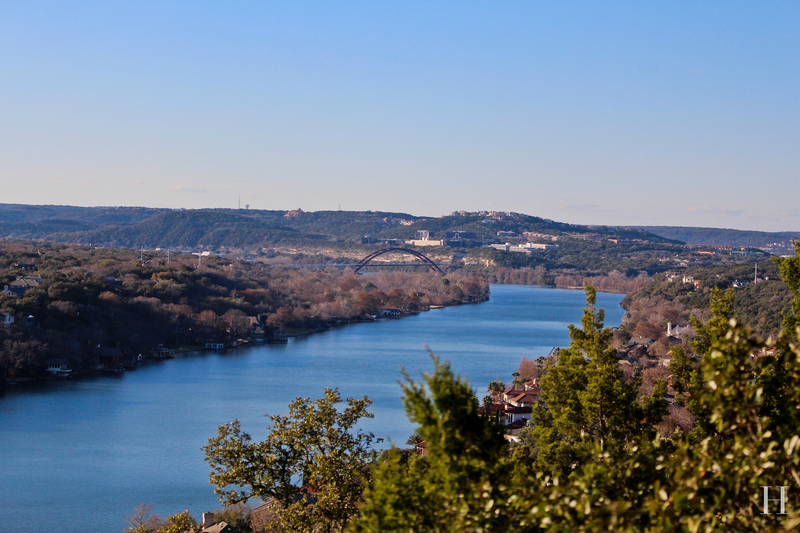 It is centrally located, and the hike up takes only a few minutes, so you can plan lots of other fun Austin adventures around it. 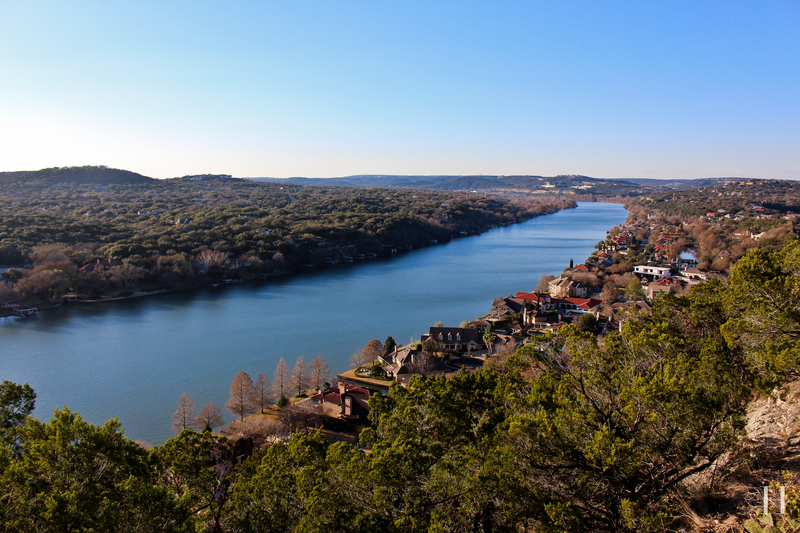 Close up of Austin’s iconic Penny Backer Bridge from Mount Bonnell. 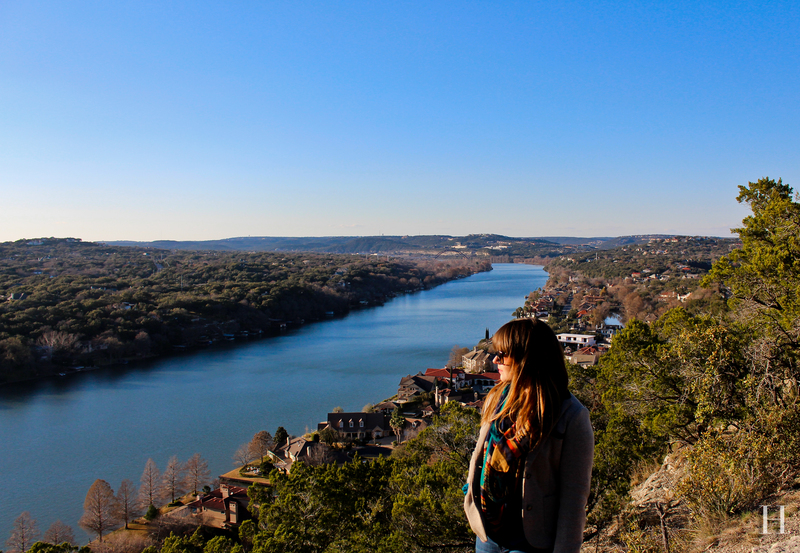 I made my first visit right after moving to Austin in 2006, and I’ve made the climb many times since. I am still amazed at the sheer beauty of this historical landmark every single time. It’s simply breathtaking! 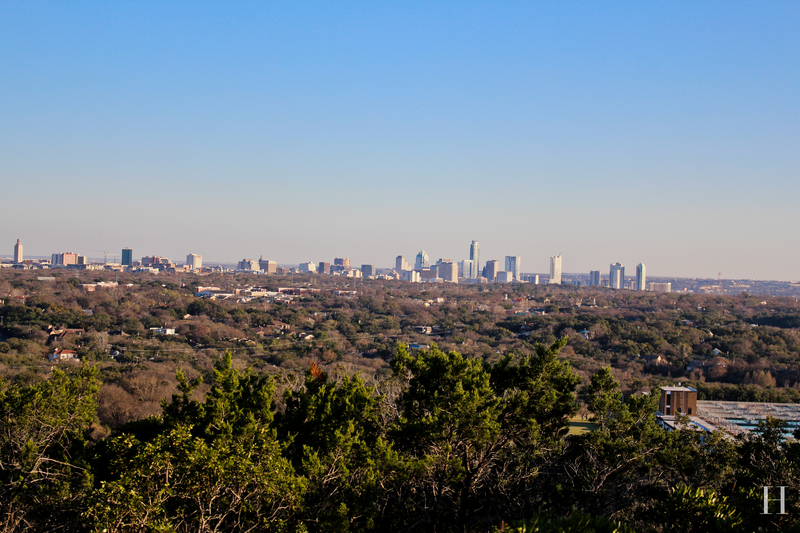 As the highest point within the Austin city limits, the panoramic views are nothing short of incredible. 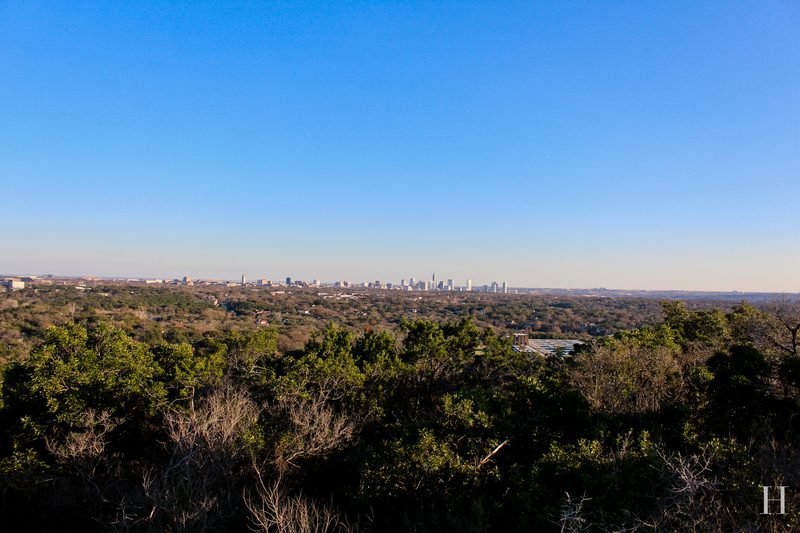 Here are a couple of shots from yesterday afternoon– two of the downtown skyline (obviously much better in person) and one looking in the opposite direction out over Lake Austin and the Hill Country. To all of my dog-loving friends, this one is for you! Yet another great aspect of this wonderful city is the general population’s pet-friendly attitude. There are a multitude of different types of venues, including restaurants, bars, parks, hotels and more that will welcome you and your pet with open arms. In fact, many of them further accommodate to offer water bowls and doggie treats! I personally do not have a dog (yet), but while my parents were out of the country over the summer, our family dog came to stay with me for a few weeks. 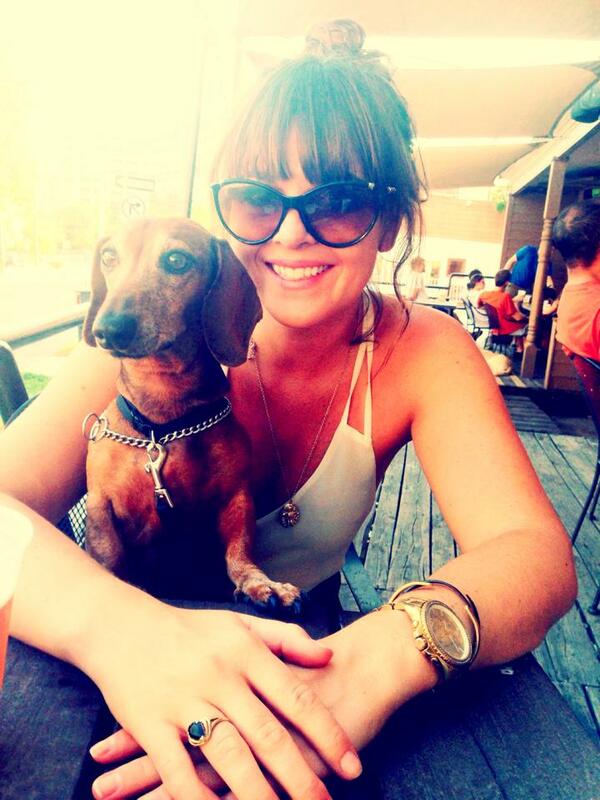 Willie Rooter is a 10 year old Dachshund who is convinced he is a person. He also happens to be one of my best friends. He looks extra dapper in this photo I took a few summers ago at our old house. William Rooter Teel, friend, licker & lover of all things related to treats and snoozing. Willie Rooter and I at Double Daves Pizza summer 2014. 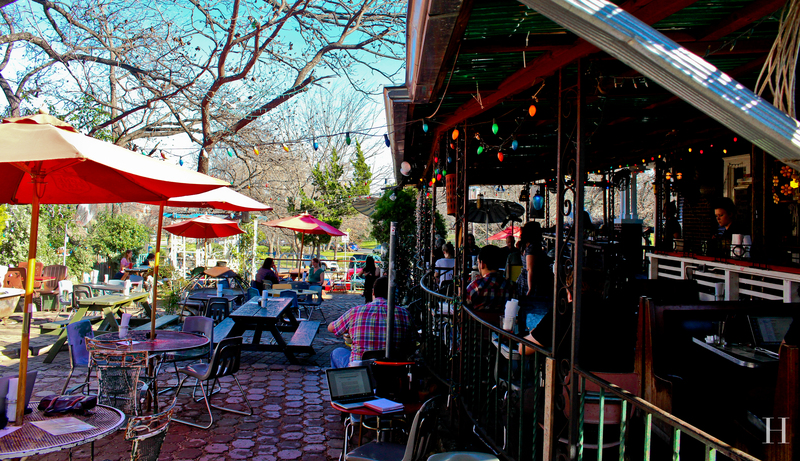 We also made it to Bouldin Creek Cafe, Double Daves, a few parks and some other places. He was truly a little dog in the big city over those two weeks, and we had fun! Austin Culture Map has a great link to the top 10 most dog-friendly hangouts in Austin, but there are many, many more! 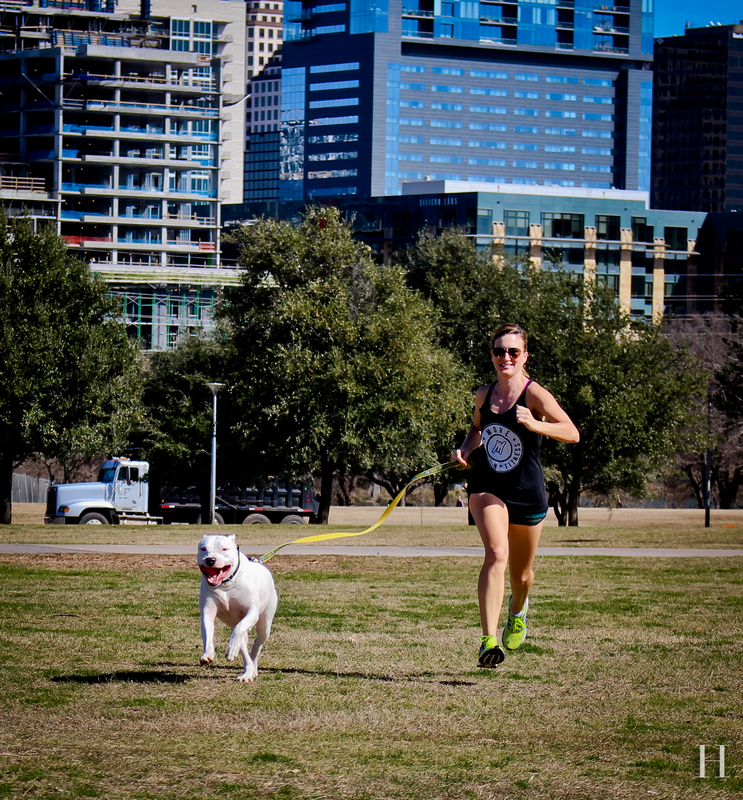 In addition to dog-friendly spots to visit, Austin Fit Magazine also hold an annual Fittest Dog Contest. This year I had the opportunity to photograph my beautiful roommate, Kate, and her awesome dog, Leon, for Leon’s submission into the contest. Kate and Leon sprinting across the park near Townlake. Leon enjoys his 4 mile runs around town lake and pushes his companion to the very end with his galloping pace of 8 minute miles (that’s tough for a 90Ib big guy!). 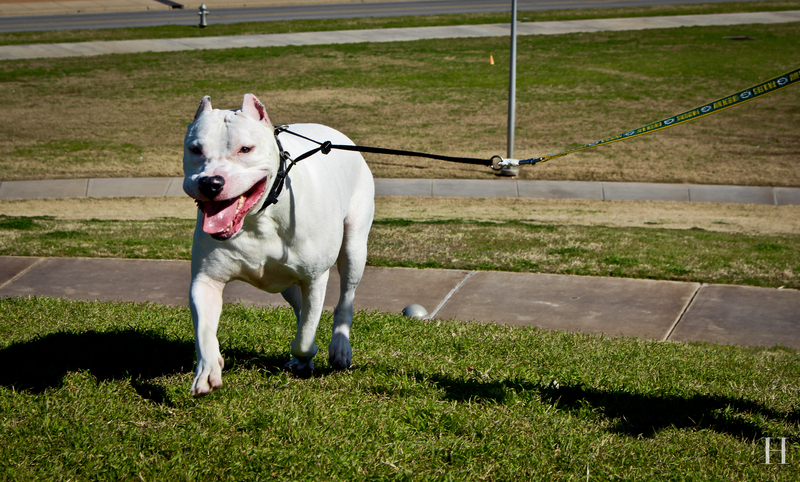 After his run, he enjoys racing with sprints along the open green and a few hill climbs by Auditorium Shores. He’s a one of a kind out on town lake getting his fit on! Leon also will play tug of war to the death, if you’re up for the challenge. Dogos were bred in Argentina over a 25 year span for the specific purpose of pig hunting, oh and also for saving little children from mountain lions. Can your dog beat up a mountain lion? Takes an athlete for that fight. Leon’s upcoming workouts include pulling a weighted tire to work on sculpting his chest. Who needs a gym, just be like Leon and go Rocky style. Look at that handsome boy go!! We can’t wait to find out if he wins!! 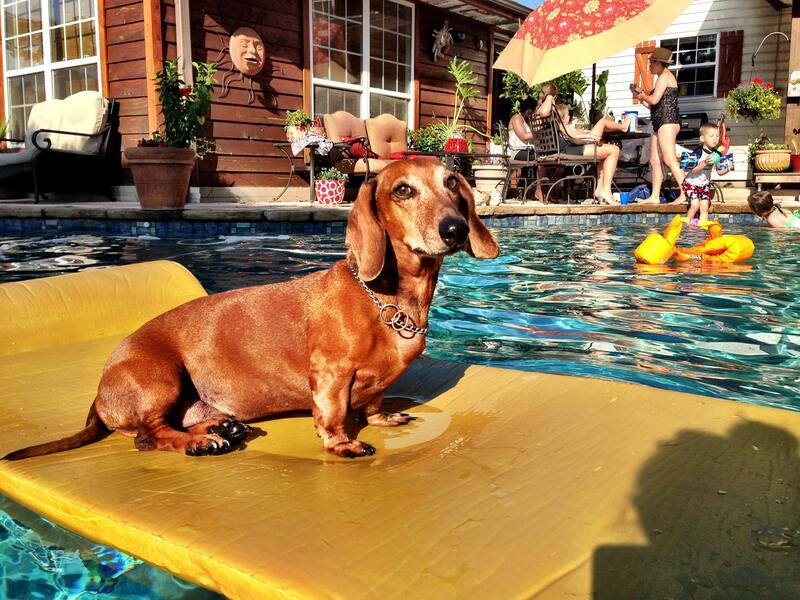 Take a look at the AFM Fittest Dog 2014 winners here— you won’t be disappointed at this overload of doggie-cuteness!! !